Israeli search and rescue team dispatched to Brazil following dam collapse operating in flood zone, accessible only by helicopter. 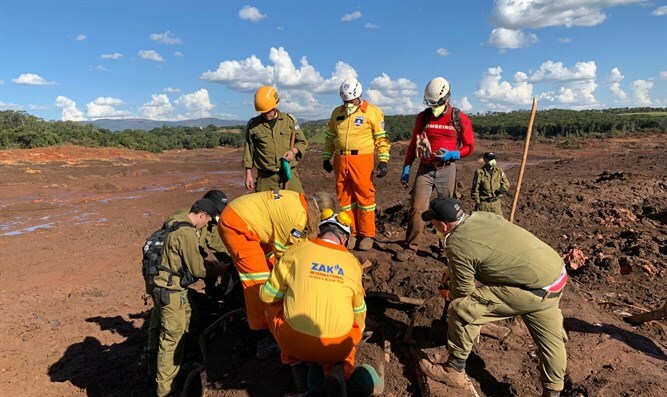 Within hours of arriving at the site of the dam collapse disaster in Brazil, an Israeli aid team located and recovered several bodies from the thick sludge. The Israeli delegation includes, among others, soldiers from the IDF Home Front Command, fire fighters, Navy divers and volunteers from the ZAKA International Rescue Unit who are working together round the clock at the site of the disaster in their humanitarian rescue and recovery mission. “The scope of the disaster is huge,” said ZAKA head of special operations Haim Weingarten. ZAKA Chairman Yehuda Meshi-Zahav emphasized the difficulty of operating in the flood zone.